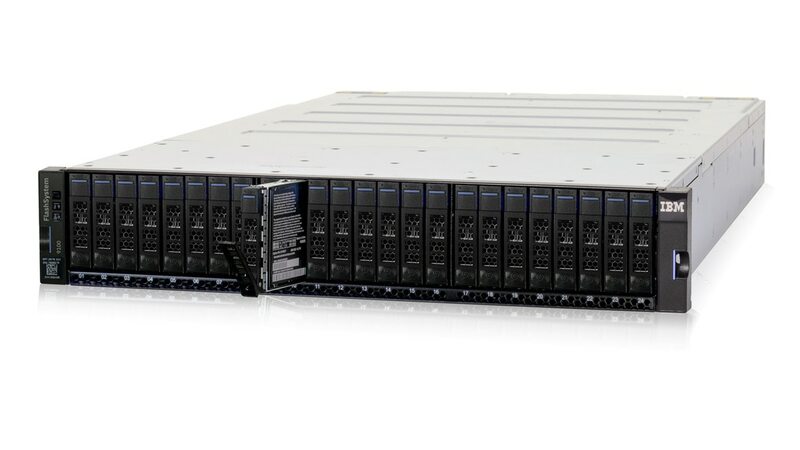 IBM® FlashSystem® 9100 combines the performance of flash and Non-Volatile Memory Express (NVMe) end-to-end with the reliability and innovation of IBM FlashCore® technology and the rich features of IBM Spectrum Virtualize™ — all in a powerful 2U enterprise-class storage system. Providing intensive data driven multicloud storage capacity, FlashSystem 9100 is deeply integrated with the software defined capabilities of IBM Spectrum Storage™ allowing you to easily add in the multicloud solutions that best support your business. Transform IT infrastructure while increasing ROI by leveraging the power of IBM Spectrum Virtualize to extend a rich set of data services across all your storage systems. Lower costs and store more data in the same footprint with 3D TLC flash and powerful data reduction pools. Secure valuable data assets with multidimensional on-premises and cloud-based data protection and business continuity solutions. Use IBM cognitive Storage Insights to optimize storage efficiency and help prevent problems before they occur.